Over the last few days there has been an exchange of emails between myself and Darren Leary of Galliford Try, (reproduced below) who are the owners of the Millhose Pub site. Galliford Try is currently in the process of arranging to remove the fly tipping and erecting some further security measures with a view to restricting access to the site. This will be done in the next 7 days. Vegetation will also be trimmed back in the near future. I am aware that my colleagues and local residents have contacted you regarding the appalling state of this site, which has become a magnet for fly tippers and all kinds of trouble. Having seen many emails I am also aware that you have chosen to lay the blame for the lack of development and the subsequent condition of the site on local Councillors, who supported local residents in opposing the planning application. Before you deny that please read this direct quote from one of your emails. The scheme was refused only once by local councillors at Committee influenced by some fairly spurious statements by one local member in particular. Regardless of that, the maintenance, protection and upkeep of this site is the sole responsibility of Galliford Try, a multi-billion £ company that boasts revenues of £2.3billion. Yet for reasons clearly best known to yourself you appear to want to leave this site, located in a densely populated residential area on a main thoroughfare in a forlorn and unkempt state, is this to punish local residents for having the audacity to object to your original planning application? On behalf of local residents I request that you stop delaying and take immediate action to clean up this site, remove the fly tipping, cut back the vegetation and maintain to an acceptable standard until such time that you have a development ready to be started, and or you sell the land to another individual or company. Myself, my colleagues and local residents do not believe that this is too much to ask. I have attached photographs taken by me this morning that are representative of the condition of this site. Readers of the blog and the wider Moreton community will be aware of the appeal made by Vodafone for a telephone mast, cabinet and ancillary equipment on Town Meadow Lane (near the the Linear Park Childrens Play Area). 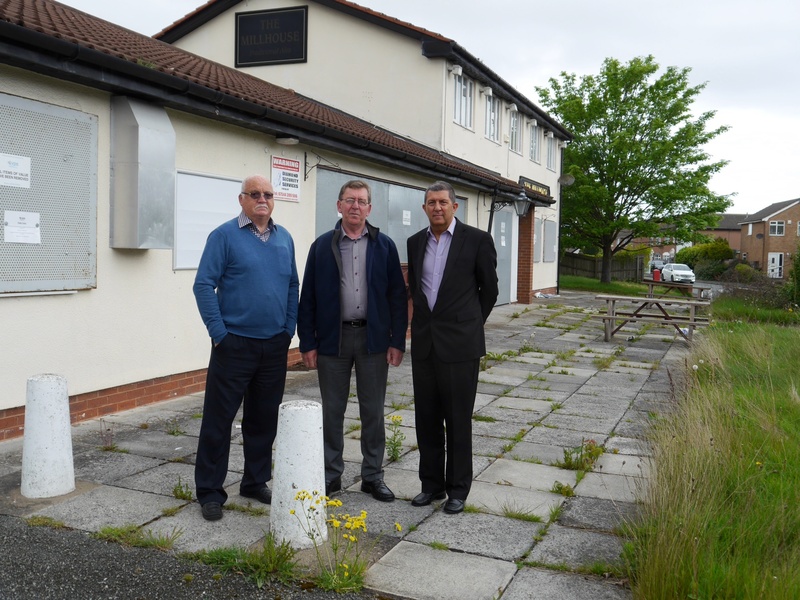 The application was originally refused by Wirral’s Planners back in April and Vodafone left it until two days before the expiry before they appealed. Initially Mott Macdonald did a letter drop to some 2,000 homes and this was followed up by a door to door survey across 400 homes. I am delighted that their report has now been finalised and can be published. Reactions to the proposed new station were generally very positive with 83.4% supporting it and only 10% against it. The survey suggested that car usage to get to Moreton is relatively high at 43% of those surveyed who use Moreton and that these users would in future principally walk to the new station at Town Meadow. The level of car parking at Moreton is not that high and this would suggest that many people are being dropped off at the station before the driver then drives to another location. This suggests that the sustainability at the station is slightly overstated. The survey indicates clear support for a new station at Town Meadow. Earlier this evening, along with colleagues, Cllr Steve Williams and Cllr Simon Mountney we attended the follow up public meeting to discuss road safety issues, and particularly speeding traffic in Millhouse Lane. The meeting was arranged to hear the results of the Councils investigations following a meeting in May. David Rees, the Council’s Group Leader for Road Safety explained to those present the results of the two traffic surveys, and the investigations surrounding the two accidents to the house in Tanworth Grove at the junction with Millhouse Lane. It was interesting to note that whilst traffic movement in Millhouse Lane has increased by 4.5% since the last survey in 2003, traffic speeds have reduced from an average of 35mph to 32,6mph, with an overall reduction of traffic travelling above 30mph from 48% down to 23.7%, a step in the right direction. In order to try to reduce traffic speed even further, and improve road safety the Council will be installing ‘Centre Line’ markings from the Millhouse Pub to Tanworth Grove, providing ‘Slow Signage’ on the carriageway and junction markings on some of the side roads. You can see the plans by clicking HERE. Engineers have also promised to review the situation in about 12 months. Me, Steve and Simon will also look to provide a ‘Vehicle Activated Speed Device’ next year with funds from are Area Forum’s Integrated Transport Block. Our thanks go to all those residents who signed the petition, those who attended the two public meetings and those who wrote, emailed and telephoned us with their views. This is a real example of a community coming together to deal with an issue that affects them all. Just a short reminder that there is a public meeting tonight at the Millhouse Pub, starting at 6:30pm to discuss road safety and traffic speeds in Millhouse Lane. I and my colleagues, Cllr Steve Williams and Cllr Simon Mountney will be there, along with a representative from Merseyside Police, and the Councils Road Safety Manager, David Rees. If you have any concerns about road safety in this area then please come along. We hope to see many people there tonight. A reminder that on Tuesday 17th August at the Millhouse Pub, commencing at 6:30pm there will be a public meeting to talk about road safety in Millhouse Lane. I, along with my colleagues, Cllr Steve Williams and Cllr Simon Mountney hope to see lots of people in attendance.